What is the one beverage that is universal whether it is 100 degrees or 10 degrees below zero? COFFEE otherwise known as Joe! Coffee has many medicinal benefits not to mention a robust flavor. It can be used as a rub for meat, enhancement for dessert or even found in facial products. As an ergogenic aid (performance enhancement) caffeine has been proven to decrease perceived exertion (how hard one feels they are working), increase carbohydrate utilization (lower blood sugar) as well increasing stimulatory endorphins that keep one alert & focused. 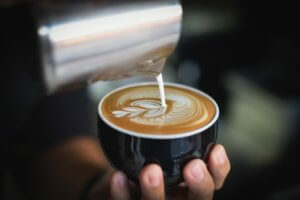 Caffeine in moderate amounts has also been linked in research studies to increased metabolism, lower risk of Alzheimer’s disease, type 2 Diabetes and gout. Just as in everything there is a limit to its effect and potential for harm when drinking more than 500mg of caffeine per day (~ 6 cups of coffee). At this dose tachycardia (fast heartbeat, muscle tremors, upset stomach and restlessness can occur. Espresso can liven up breakfast by incorporating into banana bread, oatmeal, granola, or scones. Lunch wouldn’t be so boring with a coffee-marinated bacon sandwich, coffee-chipotle pulled pork/ribs, smoky black bean soup. Savor your sweets with an espresso brownie, espresso glazed doughnut, or coffee-almond bark. Be sure to see the coffee and chocolate granola recipe below. Don’t take that morning cup of coffee for granted, there is a lot that goes into that perfecting that cup of Joe. Here is how to brew the perfect cup (National Coffee Association). Time is of the essence when comparing time that water is in contract with the grounds. In a drip system contact time should be 5 minutes, whereas a plunger pot should be 2-4 minutes. When in an absolute hurry espresso maybe what suits you best with it only needing 20-30 second contact time. Preheat the oven to 350 F (180 C) temperature. Line baking sheet with parchment paper. In a large bowl, combine the oats, almonds, and ground coffee. In a small saucepan, slightly heat the espresso, Muscovado sugar, and oil, just until the sugar is melted. Mix the liquid with oats, and transfer this whole mixture on the baking sheet. Bake for 20-30 minutes, stirring once in while and making sure oats are not burning. When granola is nicely crispy, take it out from the oven and, as long as it is still warm, mix in the chocolate. It will melt and beautifully cover the oats. Let it granola cool fully, and then transfer into an air-tight container. Need more tips on what to shop for when going grocery shopping? I got you covered here!